The higher authorities of Employees’ State Insurance Corporation (ESIC) had released the ESIC Rajasthan UDC Recruitment 2019 Notification to fill 35 UDC (Upper Division Clerk) vacancies. Candidates who are very much interested in the Employees’ State Insurance Corporation (ESIC) Advertisement 2019, they can apply on or before 15th April 2019. And from this article, applicants can get the entire details such as eligibility criteria, selection process, salary details, and others. 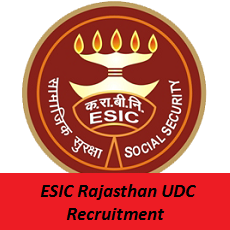 For more fresh updates visit the Sarkari Recruitment for ESIC Rajasthan UDC Recruitment 2019. Candidates can grab the complete details of ESIC Rajasthan Stenographer Recruitment 2019. To hire capable and suitable applicants for the Stenographer posts, the board members announced the Employees’ State Insurance Corporation Notification 2019. Excited aspirants can apply for this www.esic.nic.in Jobs 2019 on or before 15th April 2019. Get the complete data on Post-Wise Vacancies For www.esic.nic.in Jobs 2019 along with count in the tabular format. While checking the educational qualification, applicants must and should have to view the age limit details of ESIC Rajasthan UDC Recruitment 2019. (iii) SC/ST- 15 yearsAs per instructions of DoPT, a PWD applicant is entitled to age concession in different combinations subject to the condition of the maximum age of 56 years. Further in case of a PWD by virtue of being an ESIC/Govt. Employee, concession to him/her will be admissible either as a ‘person with a disability’ or as an ESIC/Govt. Employee’ whichever may be more beneficial to him/her. The higher authorities will assign the Selection Process For ESIC UDC, Stenographer Vacancies 2019. This fee of Rs. 250/- shall be refunded duly deducting Bank Charges as applicable, on appearing of the candidate in the Phase – I Written Examination. Applicants must and should have to visit the official site of Employees’ State Insurance Corporation @ www.esic.nic.in. Go to Recruitment section which is at top of the home page. In that search for the red blinking link of ESIC Rajasthan UDC Recruitment 2019 – Stenographer. Read and download the ESIC Rajasthan UDC Recruitment 2019 – Stenographer Notification. Fill the details in the ESIC Rajasthan UDC Recruitment 2019 – Stenographer application form correctly. Take two or more xerox copies of ESIC Rajasthan UDC Recruitment 2019 – Stenographer application form for further usage.